A few of the many varieties of coral bells that are available. Coral bells seem to be the new darling of the perennial world, with colorful new varieties emerging every year. Another native American plant, coral bells grow happily in shade, semi-shade, or filtered sun. Thanks to enthusiastic hybridizing, there’s a coral bell for every color palate. Foliage comes in shades of orange, purple, bronze, silver, and red, with gorgeous flower spikes in late spring in whites, pinks, corals, and reds. 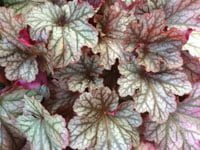 While shaped like hostas, coral bells are generally a little lower-growing (1’ to 3’); making them perfect for borders, edging, and tucking into containers. Light: Full shade to filtered sun. Can tolerate some full sun, although the leaves may scorch. Water: Low-maintenance, needing only regular water during dry spells. Soil: Well-draining, neutral to slightly acid soil rich in organic matter, with mulch to retain moisture. Division: Propagate by clump division or cuttings. Size: Coral bells range from 1’ to 3’ tall and wide. Climate: Hardy to USDA planting zone 3, and evergreen in warmer climates. Maintenance: Deadhead spent coral bell blooms to encourage more foliage growth. Mulch: In areas with freezing winters, beware of frost heaving (plants being pushed out of the ground by freezing/thawing). Mulch in fall to help prevent this, and check and replant any exposed roots. Disease: Look out for fungal diseases in damp, shady garden spots. If fungal disease is detected, move these plants to locations with a little more air and sunlight.